Twice a year, Amy of Amy's Creative Side hosts an awesome virtual quilting show called Blogger's Quilt Festival, which involves a *ton* of quilters each linking up a quilt to share. There are always hundreds of amazing entries. This festival I'd like to feature the quilt led by me and the ladies of the Faith do. Good Stitches circle. For those who have been around a little while, this will be a repeat, but for those just joining us, I'd like to do a small recap. do. Good Stitches is an online charity bee where each month we all work together to make a quilt for charity. The Faith circle donates through our local churches specifically. Each baby gets their own side. Rachel of StitchedInColor made the lovely circle block on the back, and I sort of made up the design on the back as I went. I love how it turned out. P.S. See the original post with more details about the quilt here. Love your double cot quilt! What an amazing idea! Gorgeous colour palette and the back is stunning too. I am in the Cherish circle and looking forward to my turn to create a quilt for a special charity I have in mind. Rachel has started such an amazing thing and I love seeing all the beautiful finished quilts appearing. Very clever idea "a side" for each. The grey is fabuous and I love using up fabric scraps with strings. 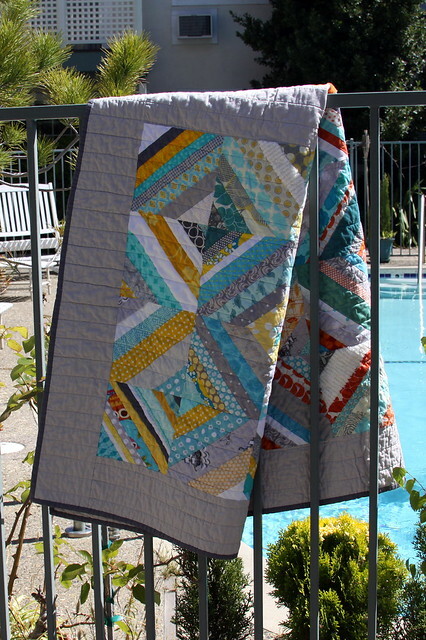 Such a wonderful thing to giveaway quilt love. That is so cute! And such a great idea for twins! Love the colors, design, backing, everything really! Great quilt! the front is beautiful...but the back is even better! What a neat idea. 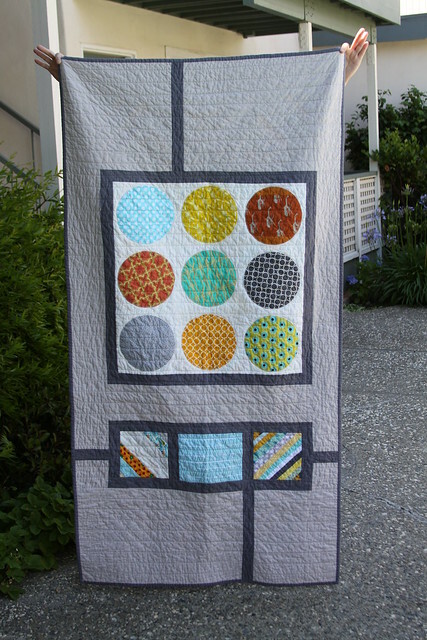 Such a cute quilt and I love love love the circles on the back! What a great gift and a really nice way to start off sharing with a sibling..
How neat is that! 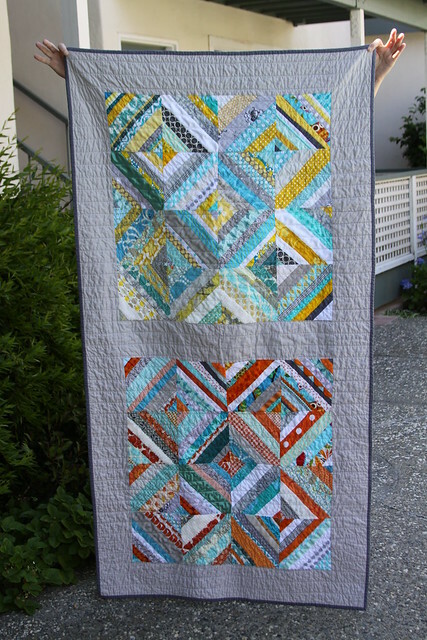 2 quilts in one! This quilt is absolutely beautiful. Thank you for sharing it with us. 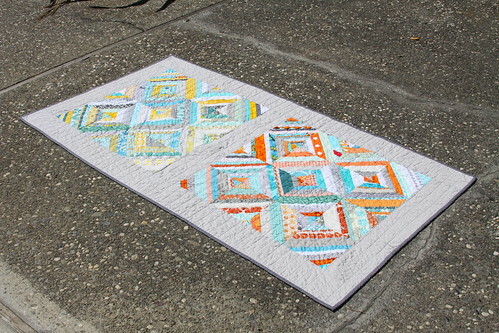 I love the idea of a quilt for 2 and what a beauty it is! I`m on the waiting list for do.Good Stitches and can`t wait to get involved. A great entry for the BQF. Thanks for the beautiful quilt Kelsey. I've been reading about the charity on Rachel's blog too! I love the bright colors and piecing. I'm a new quilter so I'm just sponging inspiration from everywhere. Thanks! Thanks for coming by to see it! Part of me totally agrees - I love the back!! I hadn't really thought of that, but that is a good point! They'll have to share it more and more as they git bigger and have to take turns haha. I'm glad you like it. Thanks for stopping by! Such a gorgeous quilt and wonderful story. Love the quilt for two idea! I recently became a stitcher for the Joy circle of the do. Good Stitches virtual charity bee and I applaud all you quilters in the various circles!! Is that ever a sweet design for using in a double stroller or on the floor. That family is sure to treasure this work of art. What a wonderful idea! Love how it turned out, too. I love the story behind this quilt... A quilt for two! What a great way to send off fellow parishoners. So cute! I love the colors and the design! Lucky little ones to have such an original quilt made for them. Love the colors, textures and patterns! SO VERY COOL!!!! lovely quilt, idea and gift. Cool quilt! I really like the circles! A quilt to be proud of! Love both sides! What a unique and clever design! I've never seen anything like it! Thank you so much for sharing it! Love both the front and back. I think that your group does a lovely thing for others! 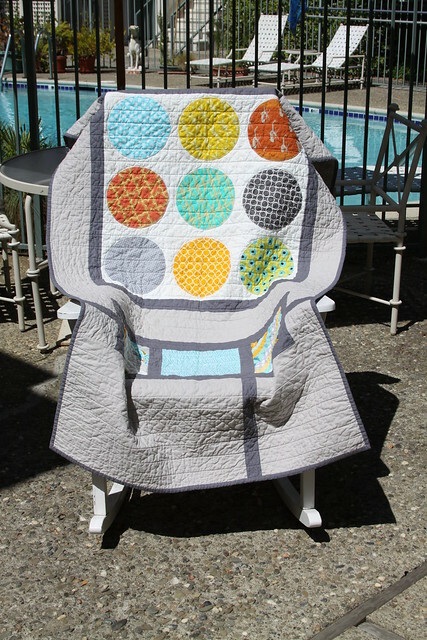 A smart looking quilt...perfect for twins. That is a really neat idea for twins! This is a wonderful idea for twins. And such a cute quilt!! Love this quilt...thank you for sharing it us. I have bookmarked for 2012...inspirational.